I am a strong believer in continuous learning. 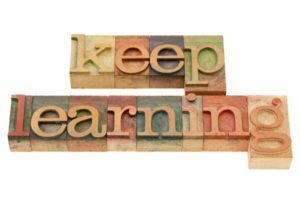 If you have been following this blog for some time you will know that I am constantly looking for opportunities to learn. I often tell the story of the time I and some colleagues were in a management meeting when the topic of learning came up. At the time, two of us were reading Marshal Goldsmith’s book, What Got You Here, Won’t Get You There (Hyperion). The third person chimed in with a statement that not only struck me as idiotic then, but still causes me to shake my head in disbelief today. He said (and I’m paraphrasing), “I don’t read any of those kind of books anymore. Since I have my MBA I know all I need to know.” I remember the setting and the individuals and those words so very clearly even though this happened almost ten years ago. Its effect on me became so profound that I am sure it had some part in my decision to go back to school in 2010 to get my MA. How could someone believe that they had nothing more to learn? This series on Soft Skills development is based on an understanding that we should be improving ourselves, learning how to communicate better, listen to understand and to be intentional in our learning, and in by doing so, gain the confidence in ourselves to be better leaders. The list of soft skills can be endless. I have chosen in this series to focus on Self-awareness, Professionalism, Communications, Team-building, Problem-solving, Time & Personal Management, Attitude, Adaptability, Self-confidence, Networking and finally Continuous Learning. It is not an accident that I started with self-awareness and end with learning. It seems to be that the first step in anything is to recognize that something needs to be done, to figure it out and then decide to do something about it. One way to determine where one needs to grow and become aware is by listening to others. This has the potential to be unpleasant and uncomfortable because it means having to listen to what others think about you and where they think you can improve. Such feedback can come in many forms, from formal performance reviews to comments made on the fly, and they aren’t always given in a positive manner — sometimes they can come as criticism. Not all of us like to take criticism, but we can attempt to take it in stride, and use such comments as a launch pad to improvement. LeBron James is quoted as saying: “I like criticism. It makes me strong”. The ability to listen to and accept criticism is a key component of self-confidence. One way to get out in front of this is to actively ask for feedback on how our actions affect other people’s performance. It demonstrates that we value what others have to say, and helps develop a sense that we are committed to what we do and to our own growth. In an ongoing study by Kouzes and Posner, in their work on leadership (The Leadership Challenge, Leadership Practices Inventory), they find that this one item consistently ranks at the bottom on surveys of leaders. Next… how to learn and grow from criticism. ← How can Self-confidence drive success?